On her eighth musical release folk-singer Linda Allen gives us Carry Us Through This Night. This music is soothing, warm, and comforting – each song glows like a wintertime fire and has an authenticity and power, which Linda Allen can express to tap into the softest parts in all of our hearts. The guitar and piano melodies, violin and cello playing, and vocal harmonies all combine to create the eighteen-song masterpiece. Sometimes it’s about the simplicity of the message and the structure, which can bring about the most inspiring messages. Linda Allen captures these sentiments and allows the music to lead you to the truth of her words. Carry Us Through This Night carries a seasonal presence, and it’s the perfect soundtrack for the holidays. The song “My Whole Heart” is about Thanksgiving, and the acapella style harmonies found in other tracks like “I Will Lie Down” and “Invocation” is reminiscent of Christmas carols. Linda Allen reminds us to relax and enjoy the life around us in the track “Take Off These Shoes” as she digs deeper into a country-style of playing. She always brings about the higher virtues in her music such as love, compassion, selflessness, and patience. It’s as if each track carries something special, something true to her own heart, and she shares it so joyously. 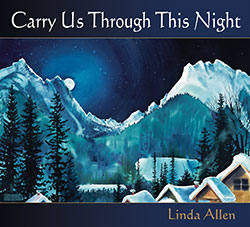 The uplifting spirit of Linda Allen radiates within the music of Carry Us Through This Night, and the songs are reminders to be better to each other – to be better to ourselves. Give your loved ones a true gift this holiday season by playing some heartwarming tunes from the Linda Allen collection.